Tangelle is 195 km away from Colombo and has a population of 62,000 making it the biggest town between Matara in the west and Hambantota in the east. The town center is a typical Sri Lankan main road with shops on both sides where you can get good and cheap Sri Lankan food. It's always fun to dive into the shops and have a closer look at the offered goods. Don't be shy and step into the shops. You will at least get a smile for free. You can combine this with a visit of the local market (see the Tangalle Market article later on). Tangalle has a regionally important fishing port where you can see plenty of colorfull boats. If you show up in the morning or late evening you can see the boats come in and unload their catch. 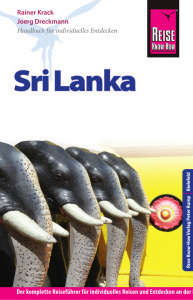 The name of the town in Sinhala means "projected rock", a reference to the rocks which form the coastline in the town area, which contrasts with the sandy beach of the surrounding areas. Another rationale is that the name is derived from ran-gala or "golden rock", which relates to a local legend that a holy man once ate a meal there and the rock was turned to gold. There are a lot of great day trip destination around Tangalle which we will try to cover in the following articles. 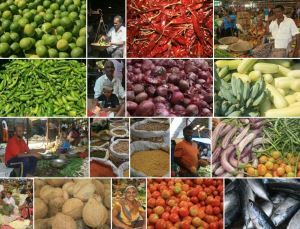 Every Wednesday and Sunday is market day in Tangalle. Close to the bus station is the new market where hundreds of vendors offer all kinds of vegetables, fruits, knifes and kitchen equipment under a big roofed court. Most likely you will be the only tourist and it's a good opportunity to take nice pictures. 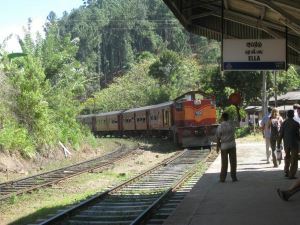 A train ride is a must for every Sri Lanka visitor. You can take the scenic costal route from Colombo to Galle or Matara or you ride the world famous hill country train through the tea plantations. 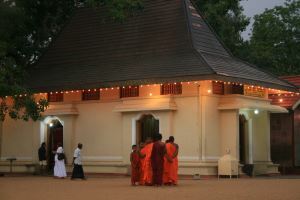 Kataragame is along with Adam's Peak the most important religious pilgrimage site in Sri Lanka and is a holy place for Buddhists, Muslims and Hindus alike. It's about 1,5 h away by car and worth the trip since it's much less touristic than the temples within the cultural triangle and the influence of the different religions makes it very special. You should plan on one day to go there and return. You can also go there if you are planing to visit the Yala national park (but you can hadly do this on the same day). 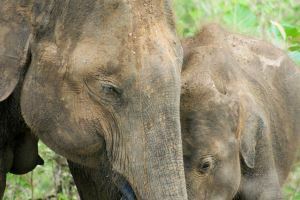 The Uda Walawe National Park is one of the best places in Sri Lanka to see elephants. The park has a population of around 1000 resident and migrant elephants. You can see lots of birds, crocodiles and monkeys. We recommend the Uda Walawe Park rather than Yala because it is less visited and thus offers a more peacefull experience. It is a 1,5 h drive by car from Tangalle and we can arrange a Safari Tour for you.